Jessie Hilgenberg's Power Plyo Circuit Workout! Don't pass on plyometrics. 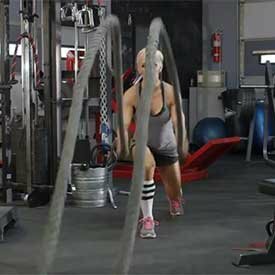 Elevate your heart rate, fire up your fat loss, and become a better athlete with this simple workout-circuit video! Plyometric training, which involves explosive movements, is a great way to boost your performance, potentially improving your conditioning, endurance, muscle power, muscle growth, agility, and speed! Whether you use plyo training for cardio or as a muscle-building workout, this circuit is guaranteed to challenge you. Since it's a lower-body-intensive workout, I like to think of this session as my second leg day of the week. For this workout, you'll complete a seven-exercise circuit. If you're a beginner or are not used to plyometrics, start slowly. Do one round, see how you feel, and check in with your body. Take a full three minutes to rest between rounds. Grab a sip of water, catch your breath, and if you know you can do a second round, go for it! Your goal is to get through this entire circuit four times. Give this workout a try when you want to bring an added layer of awesome to the table. I still follow a standard bodybuilding split with leg days, shoulder days, and back days, but I love to add in this plyometric routine to help torch fat, burn calories, and build my athletic base. This is a well-rounded workout that focuses on all the muscle groups of the legs and really taxes your system. You'll find that most of these exercises are similar to their traditional counterparts—you're just adding a bit more explosive power to them. Now, let's get started! Note: Rest 15 seconds or less between exercises, rest 2-3 minutes between rounds. Supports Clean & Sustained Energy For Improved Athletic Performance! Go Now! This exercise works on your speed, agility, and athleticism while targeting your legs and glutes, especially your outer thighs. Choose any object to jump over, as long as it's less than a foot high, and you'll be golden. The goal here is to get as high as you can, so think vertically as opposed to laterally. Jump all the way across, get your back foot behind you, and jump back over. If it helps you balance, touch the toe of the foot behind you after you land. The point is to get a lot of air, get your feet off the ground, land softly, and get it done. With high knees, you want to have quick feet and get as much air as possible. This exercise is all about speed, agility, moving quickly, and landing softly. Don't just jog in place; you need to get your knees up high. When you're done, you should feel the burn in your quads. For this exercise, you can pick any obstacle to jump over, even a small ball. Focus on height and quick feet, but also remember to keep your legs together. When I build a plyometric workout, I really like to alternate between double- and single-leg exercises. This workout is no exception. Complete these hurdles as quickly as you can, because this movement, again, is all about speed. At this point, you're halfway through the workout, and you're back to a single leg. Place your back foot on a bench, box, tire, or whatever surface is available to you—as long as it's at about knee height. Complete a traditional Blugarian squat, jumping up before landing softly. You should be getting fatigued by now. Hang in there! Make sure you clear a space and rev yourself up for this movement. Burpee box jumps are probably the hardest exercise of the entire workout, and unlike the other movements, incorporate your entire body. Remember, you don't want to leave your upper body out of a full plyometric workout. The lower rep scheme on this exercise will provide a bit of a breather, but that doesn't mean you'll have room to slack. Once you get started, you'll quickly realize how many muscle groups and how much energy this workout requires. You're not just doing a burpee; you're jumping up on a box (or a bench) during the exercise for every single rep. While you do these split-squat jumps, you'll feel a lot of fatigue in your legs. After all, you've been working them like crazy! Just make sure that you stay strong and keep your form intact, even though you're fatigued. If you don't have a resistance band, don't worry; just perform regular kettlebell swings. If you do have a resistance band handy, loop it around the kettlebell and stand on the band with both feet. Adding that resistance just throws a little extra oomph into your workout and helps work your shoulders a bit more. Every rep counts! IFBB Pro Jessie Hilgenberg is an up and coming Figure pro and Team Bodybuilding.com athlete!